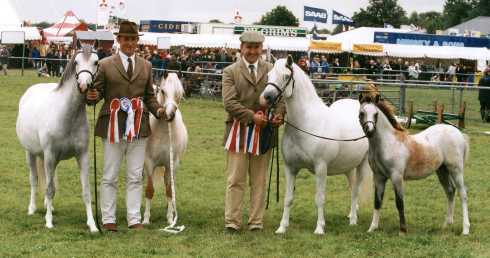 Kent County Show 2000. from right; EYARTH WINDFLOWER, Champion Section B; SUNWILLOW GEORGINA by Heniarth Quip, Reserve Section A Champion; SUNWILLOW YASMIN, Section A Champion & Reserve Wembley Breeders Challenge; HENIARTH YIPPEEAYEYEAH by Roseisle Pandy Tudyr, winning foal. 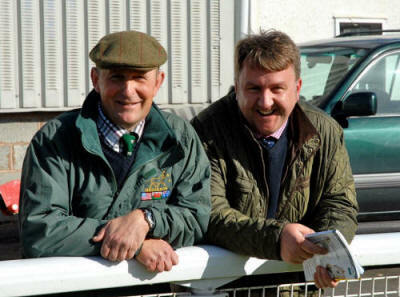 HENIARTH was formed in 1995 when Richard and Meirion moved to South West Wales, though the prefix was first registered by Meirion back in 1978 when he bred some Mountain Ponies alongside his parents Rhoson Stud of Section B ponies. 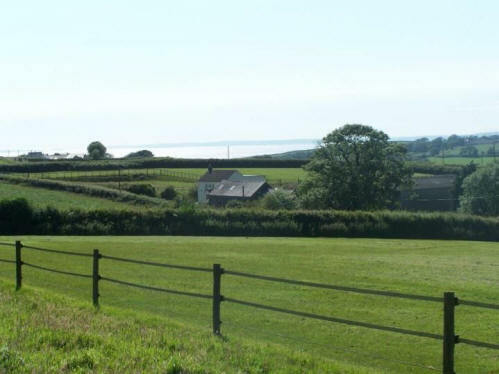 The prefix itself, roughly translated from Welsh into English means, “old farm yard,” and was the title of a novel written by a family relative, W.Beynon Davies. At the same time Richard had Section A’s under the “Blesslea”, prefix, in between time spent at the Sydenham Stud of Welsh Cobs and Grazing Fields Farm (Penrhyn Stud) in the U.S.A. When the opportunity arose to purchase Sunwillow Quest on the 1994 Fayre Oaks Sale, many of the current stock were sold in order to secure her. Richard had shown Quest as a two year old and witnessed her collect the Royal Welsh Reserve Youngstock and Female Championships in 1985. In the process of paying 4,500gns. 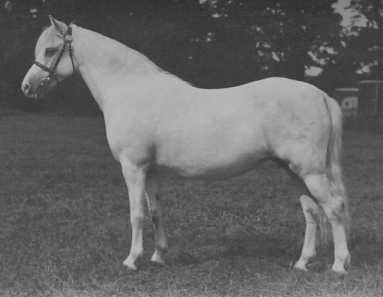 Quest became the highest selling Welsh Mountain pony mare ever to be sold at auction, (a title she held for over 10 years), and she became the cornerstone of the Heniarth stock and the Sunwillow bloodlines it has collected. 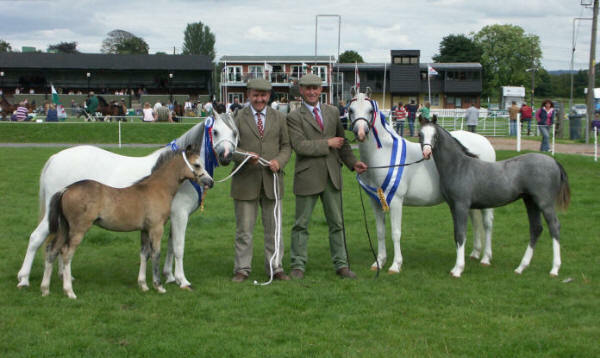 We have endeavoured to consolidate the blood of five times Royal Welsh Champion, Coed Coch Siaradus (right) through a direct line from her daughter, Coed Coch Seren Wen, Fayre Oaks top price in 1966, and her daughter, Sunwillow Bernina, Royal Welsh progeny group winner in both 1985 and 1988. 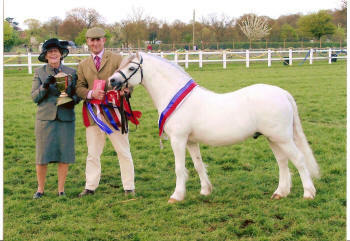 Prior to Quests arrival, her daughter, Sunwillow Yasmin was in residence, among her many show ring victories have been Royal Welsh Reserve Female Champion in 2000. 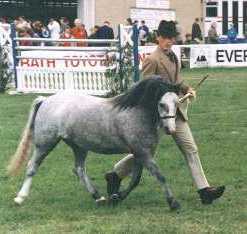 She was also part of Quests winning progeny group at the National Pony Show in 1997. A gift from the Dukes Hill Stud in 1997 saw Sunwillow Mutters come to Heniarth, dam of the successful Dukes Hill Magnum. When bred to Quest, therefore doubling up on the blood of Sunwillow Bernina, Magnum produced Heniarth Quip, Royal Welsh winner in 1997 and sire of Royal Welsh and Horse of the Year Show qualifiers. Mutters also produced the 2000 Royal Welsh winning yearling colt, Heniarth Mr.Milligan, who became a leading stallion in Sweden, returning to Heniarth for 2005/06 when he was Reserve Male Champion and Ridden Champion at the Royal Welsh 2005 and again in 2012 when he qualified for the Cuddy Horse of the Year Show final. Having disbanded the Section B herd on the 1996 Fayre Oaks Sale, closely followed by the sale of the Royal Welsh, Royal Highland and Royal of England champion stallion, Cottrell Faberge, it was rather an unplanned move to purchase Eyarth Windflower on a visit to the Eyarth Stud in 1998. Windflower has exceeded all expectations including winning the Royal Welsh a total of six times in succession, taking the Reserve Female and Youngstock Championships in 2000 and the Overall Section B Championship and Horse of the Year Show Supreme In-Hand Championship in 2002. In 2003 she repeated her Royal Welsh Champion success as well as being named Supreme Native Pony Champion at the Royal of England. In 2004 she was Reserve Female and Reserve Overall Champion at the Royal Welsh, her yearling daughter, Heniarth Whoopsadaisy selling for £3200 at Fayre Oaks . She didn't attend the 2005 Royal Welsh but was once again Female Champion. Her stock currently reside on three continents. Sadly in 2014 we lost Heniarth Yum Yum who will go down in history as the only Mountain Pony in the history of the Royal Welsh Show to be Youngstock Champion (2005) and then return as Overall Champion (2012) We thankfully have two daughters in Heniarth Dilyscious and Heniarth Gloriumptious to carry on her side of the family. 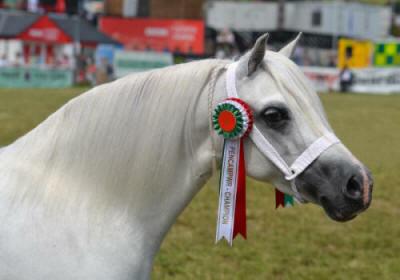 However her achievements will not go unrecorded as together with Heniarth Wood-Winds Section B Championship gained in 2014 Heniarth became one of only four studs in the history of the Royal Welsh Show to win both the Section A and B titles with homebred animals - the others being Coed Coch, Gredington and Springbourne. More remarkable seeing as we have only breed just over one hundred animals by the end of 2014. Richard Miller - is currently on the W.P.C.S Judges Panel for Sections A,B,C and D. Also on the National Pony Society Judges panels for Mixed Mountain & Moorland breeds, Riding Pony Breeding and Hunter Pony Breeding as well as the Shetland Pony Stud Book Society Judges panel, the British Show Pony Society Mountain & Moorland (Heritage) panel and various Showing Register panels. He has judged throughout Europe, North America and Australia, including the Royal of England, Melbourne Royal, Royal Winter Fair Toronto, the Horse of the Year Show, the Royal International Horse Show, the International Welsh Shows in Belgium and Denmark, together with the South African Horse of the Year Show. Meirion Davies - has judged in Eastern and Western Australia as well as major county shows including the Royal Welsh Show, Royal Welsh Winter Fair, the National Welsh Show and on the continent.